With all of the freezing weather that we have had lately, I thought it was time to discuss water in its solid state-ice! We began by discussing the difference between water in it’s liquid state and in its solid state. The night before, I filled one paper cup, per child, with water and stuck it in the freezer. 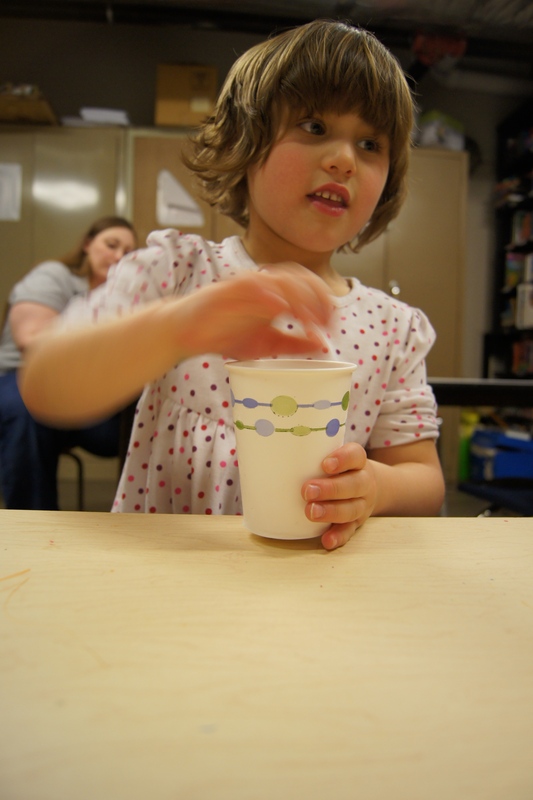 I passed out the cups to each child and we made observations using our senses. We talked about how solid it was, how cold it felt, and how parts of the ice chunk were turning into water. 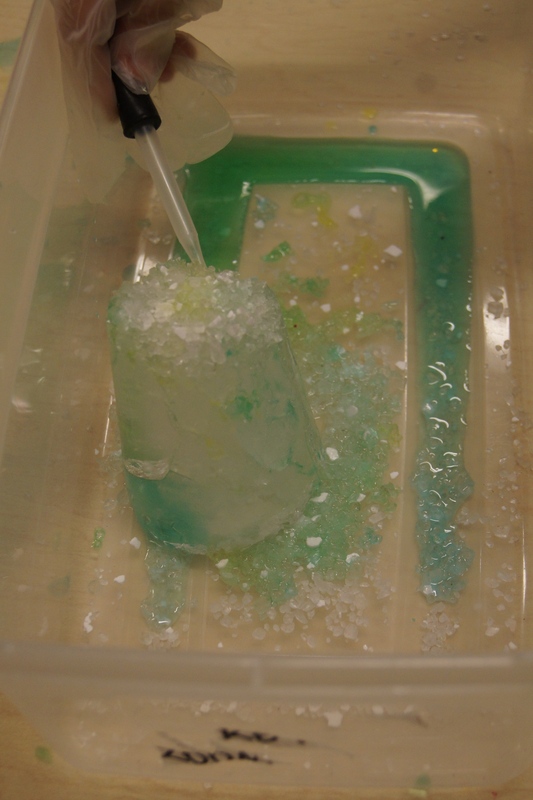 I gave each child a container to put their ice chunk in so the mess could be easier to clean at the end. I also gave each child a per of gloves, an eyedropper (because it is more fun when color is added! ), a cup of salt, and cups of colored water. The kids got right to work! They watched as their ice was quickly melted by the salt. You can’t really tell in the pictures, but the combination of salt and colored water made these river-looking panels down the sides of the ice. The kids had a blast sending different colors down the rivers. 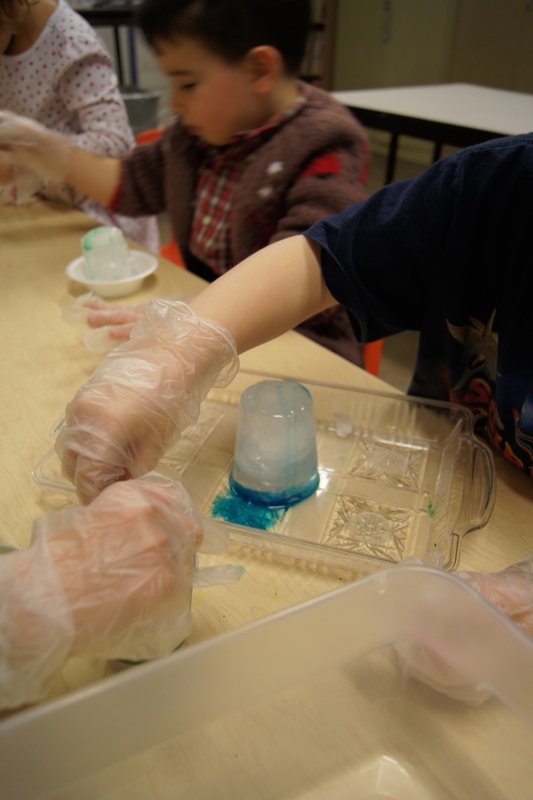 The scientists were determined to melt their entire ice chunk! It can be difficult to hold the attention span of preschoolers on one topic for forty-five minutes. However, this activity did!!! I actually had to stop the scientists so we would have time to record their observations in their journals. I highly recommend doing this experiment. I was thinking that next time, I may put something in the ice that the kids need to get to, such as a plastic toy. Literacy Fun with an UNHAPPY ending! We decided that it was time to help our feathered friends make it through the cold winter. 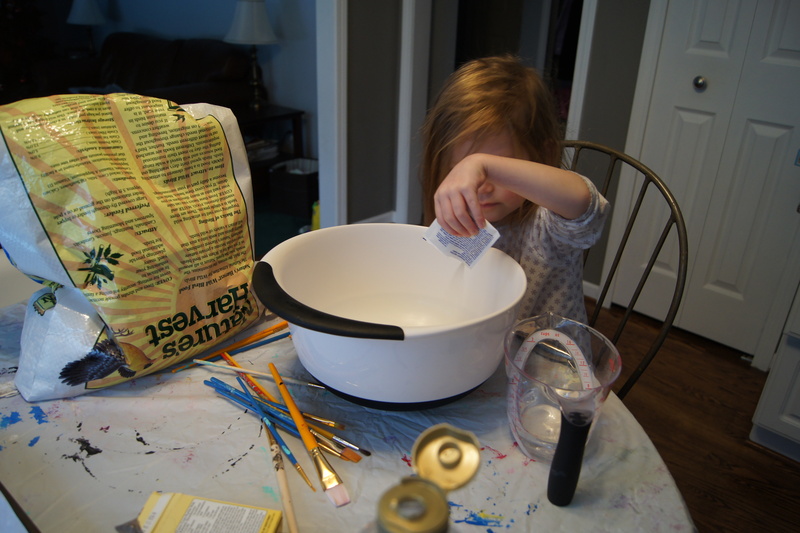 So we bought some birdseed and got to work making bird feeders! 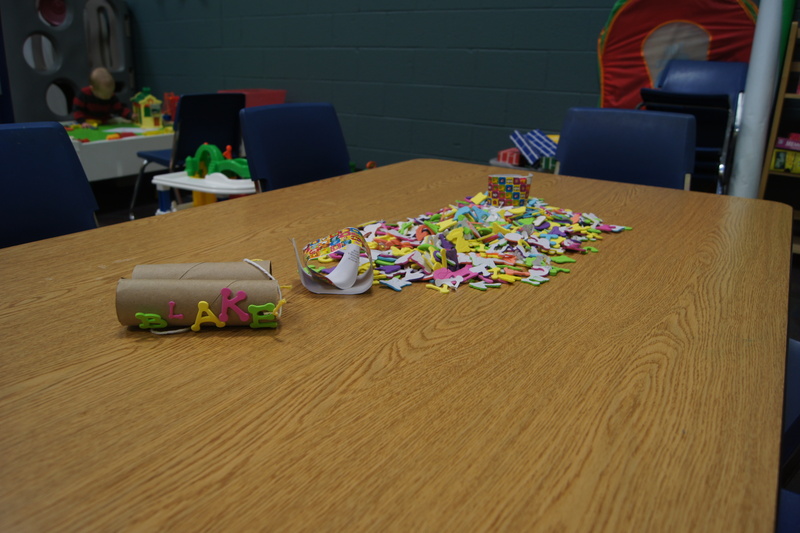 I jumped on the chance to incorporate some literacy into our fun and here is what we did…. 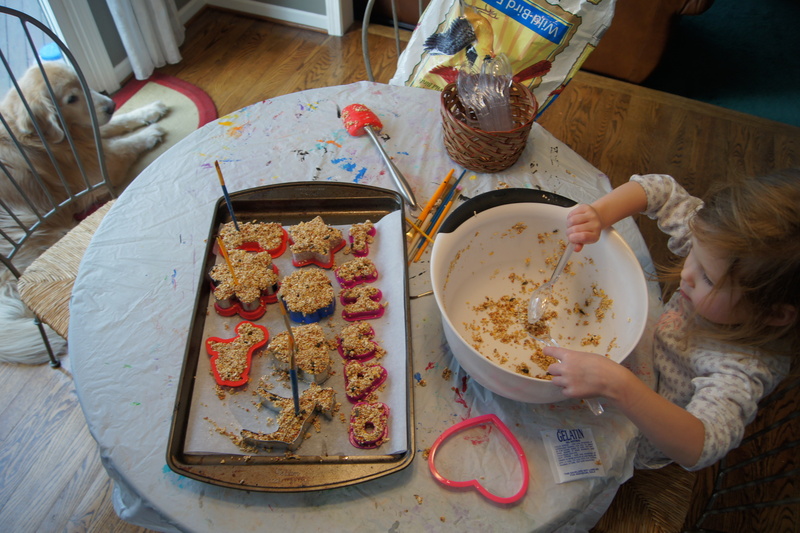 I found several recipes for bird feeders on Pinterest, here is the one that we used. 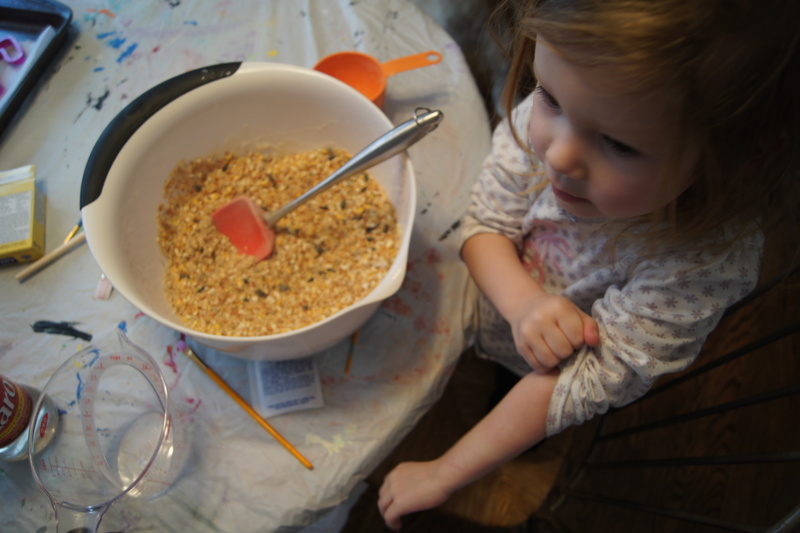 The blog is called Saltwater-Kids and her bird feeders came out perfect and beautiful. Our feeders were a bit crumbly probably because I am not meticulous with anything so I probably miss-measured or some over-stirring could have occurred. 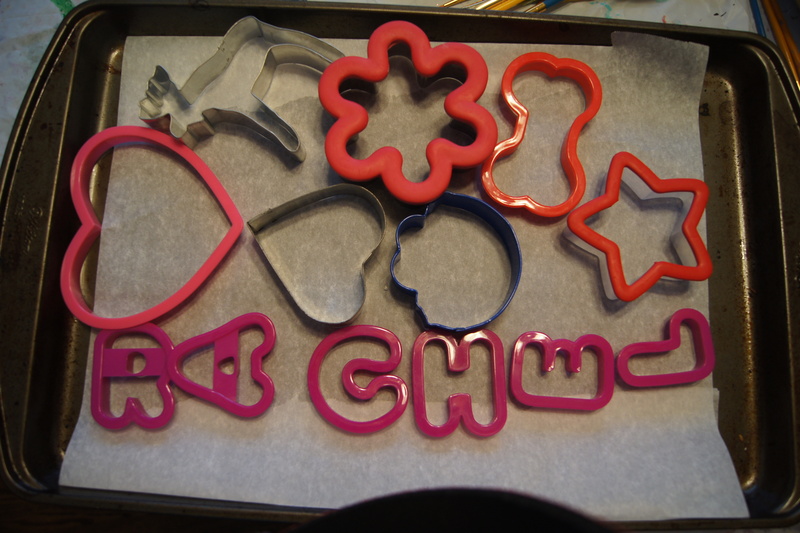 First we gathered our ingredients, including our molds. This is where the literacy came into play. 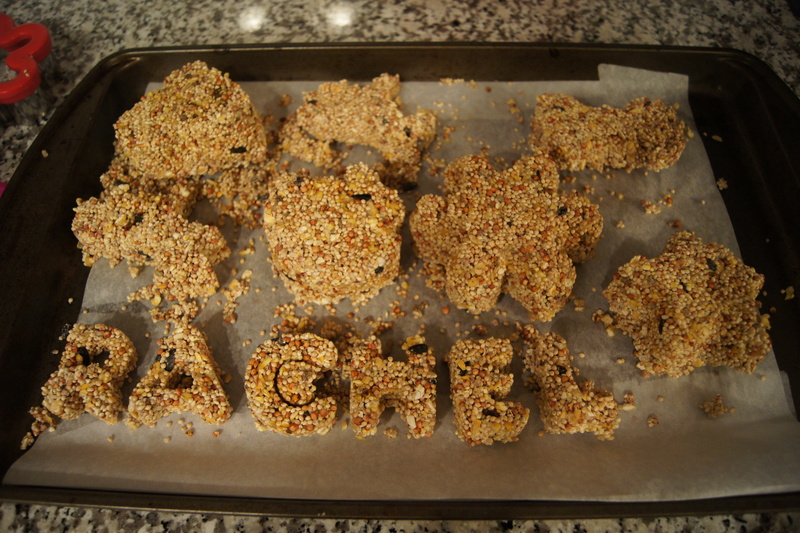 For our first time doing this project we took out our letter cookie cutters and spelled out my daughters name. 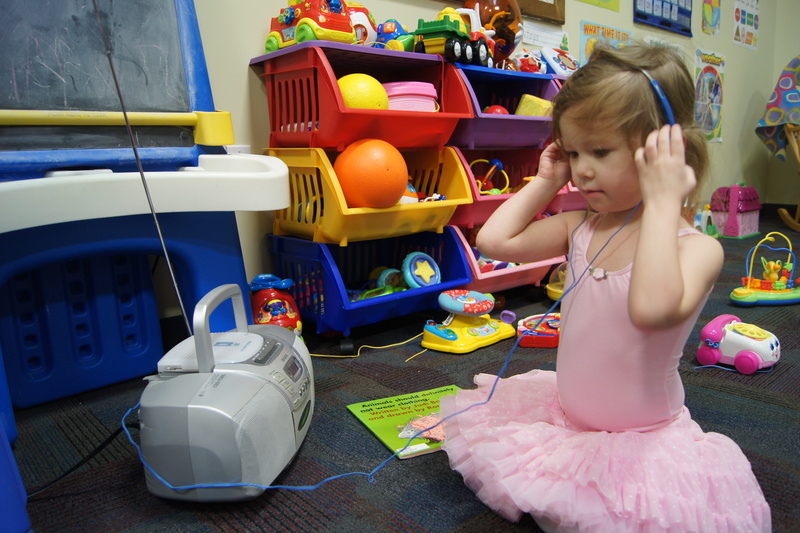 However, next time, we may do some sight words or things that she is interested in such as dolls or bananas. We could do anything as long as we are talking about the different sounds of the letters and we are exposing her to what different words look like. “Rachel,” Cookie Monster, Dog Bone, and a Moose-Perfect! Next we had to mix our ingredients. This was my daughter’s favorite part. She loves cooking and this was a chance for her to go nuts stirring in a giant bowl. 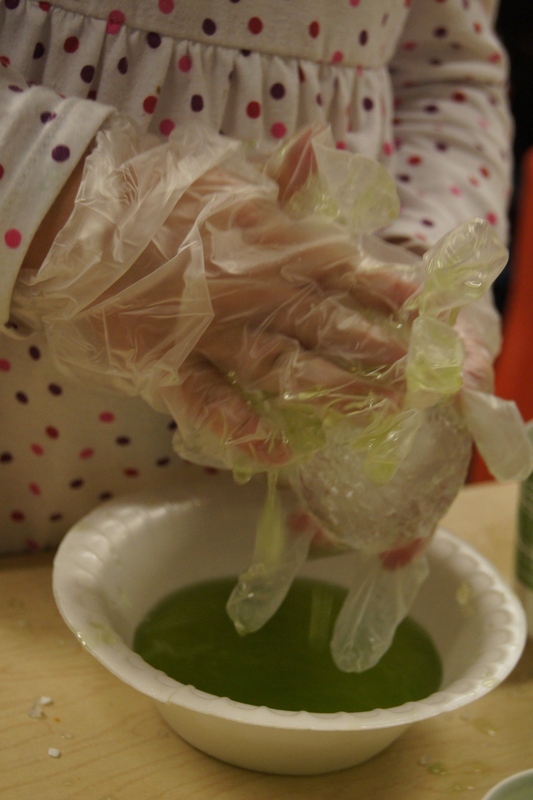 Once we had our ingredients mixed, we started filling the molds. I didn’t have straws, so we used paintbrushes because we were going to just use string to hang the feeders in our backyard. See that dog to the left, we will be getting to him. He may look sweet and innocent..
We finished filling our molds and set them out to dry. Aren’t they pretty!?!? We were so excited to hang them the next morning. We were looking around our yard trying to pick out which tree was going to be the “Rachel” tree. Oh the anticipation! Unfortunately, while we were resting our heads after a long day of learning, our precious dog was up to NO GOOD! When we came downstairs in the morning, we were greeted with a huge birdseed mess!!! During the night, he got on the counter and ATE our beautiful birdfeeders! Ugh! I wish I had a picture of the devastation, but I think that I was too heart-broken to take one. I’m sure that we will try this project again soon(I will keep you updated). Maybe next time we will do all words that start with the same letter or rhyming words. One thing is for sure, next time we will store them WAY too high for our four-legged friend to find them! Sorry I have been a bit MIA lately! Last week, our class was unfortunately canceled because of the snow. So this week, I went ahead with our Winter Animals Theme. We had a blast! 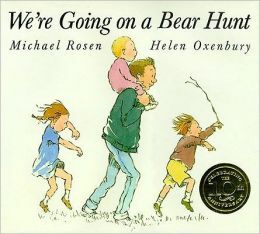 First we read most of “We Are Going on a Bear Hunt” written by Michael Rosen and illustrated Helen Oxenbury. We talked about how bears are hard to find in the winter because they hibernate. We decided to go on our own bear hunt. 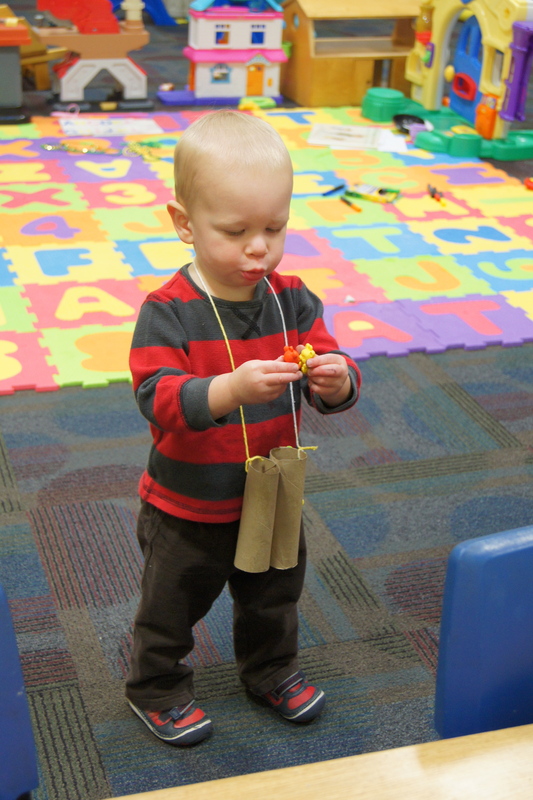 First we created binoculars (out of toilet paper rolls, string, and decorations). Then we walked around the room searching for the bears that I had previously hidden (I hid some counting bears). The kids had so much fun looking through their binoculars and finding their bears. I had letters that kids could use to label their binoculars. They didn’t stick that well, but it worked! Uuuhhh, Look what I found! I have three classes to plan for in the month of January. 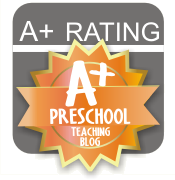 We meet once a week for an hour and a half and it is a tot and caregiver class (check out my guidelines here). Snowmen is the theme for the first week. We are going to “read” The Snowman by Raymond Briggs. I say “read” because it is actually a wordless picture book. I am also going to have a wide selection of snowmen books available for caregivers to browse throughout class. 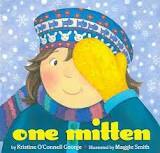 I have listed a few in my Preschool Class Winter Theme, part one here. Here are the centers that I am planning, please excuse the spacing issues! Shaving Cream Writing Shaving cream is so great to use with kids! It cleans and it looks like snow! For this activity, kids can write different letters with their fingers in shaving cream Disposable lasagne tray or tub, I had one sitting around the house and of course shaving cream-dollar store, again. I am so excited to try these out on Monday! I will update you will pictures and feedback on how everything goes! Enjoy! I am getting sooo excited for my upcoming classes! I have lined up all of my themes for the next 16 weeks, starting in January. I thought that I would share some of the winter-themed ideas that I am planning to do to help promote early learning for my preschoolers. This year, just after my daughter turned three, we decided to try adding to our holiday traditions by attending The Nutcracker Ballet. My daughter loves dancing and music, however, she tends to get scared often (actually VERY often). I thought that if I overload her with the story of The Nutcracker it would get to a point where she knew what was going to happen, making it less scary. I decided to share some of the strategies and materials that I used, as well as some that I am planning to do in the future. Ok, my first step was to go through all of my boxes and boxes of books that I have in my basement from my classroom. I found an absolute gem that I forgot I bought. It is called “The Nutcracker” by Susan Jeffers. You can find it here. This was by far the best component to our little Nutcracker unit. This is a beautiful book. I have a full review here. My daughter and I fall in love with it! I can’t even tell you how many times we read it (and it isn’t short by any means). This started her obsession with the Nutcracker. She loved him! Yeah, this just might work out after all! Next, I went to the good ol’ trusty library to see what they had for us. They had a lot of informational books that may be useful in the future or something that I would actually like to look through when I get the chance (HA!). I do think that maybe next year, these can be books that I would leave in her room and she could look through them herself and see all of the different photographs and drawings that they have in them. One was by DK Publishing book, entitled, of course, The Nutcracker. I also picked up Auntie Claus: Home For the Holidays. I am not familiar with the series at all. It was a fun book about a little girl who is playing the Sugar Plum fairy in her school play. Again it was fun to read, I think especially for older kids who may get some of the humor better, but it wasn’t what I was looking for. I also picked up a few more books, none of which I feel are worth mentioning, either because they were not about the story of the nutcracker, or I just didn’t care for them. At the library, I also checked out a couple of CD’s of the music from the show. I played them in the background of our playtimes and the kids loved them! Every so often they would just start dancing. It was so cute. One of my personal favorites is here. At this point, my daughter really liked the music and understood a bit about the story. Next, I wanted to introduce her to the concept of seeing a show in person and I also wanted to show her what a nutcracker was. On my ipad, I found an app that is FREE (because I am super cheap and refuse to pay for apps) called The Oregon Ballet Theatre Presents The Nutcracker. It seems to be part of their program that they hand out, but you are able to watch a couple of the performances. This was really fun, yet a bit confusing for my daughter because one of the ballerinas wasn’t wearing a tutu (how dare she!!). To take care of the actual Nutcracker, for whatever reason, was a bit more difficult. I could not think of where to buy one. I checked a couple stores that I happen to be at anyways and they didn’t have them. We did venture to one of the large home improvement stores, and viola! There he was, OUR NUTCRACKER, and all glittered up nonetheless! We took that bad boy home and put him right on the mantel where he belonged. I am sure that this time of year and after the holidays you can get great deals on these. Maybe I will pick up one in a few weeks at a bargain for next year. Upon further investigation, I found that there are some really funny ones out there! Ok, so we read our books, listened to our music, and had our own Nutcracker, we were good to go! My daughter was very excited for the show and she ended up loving it. She seriously wasn’t scared at all! It really goes to show the more you can expose and prepare children for certain situations through the trusty pages of books and such, the more prepared and successful they can be! I use this method all the time with different experiences, such as going to the doctor, starting school, whatever it may be. I will be sharing more of my ideas and resources on this matter with you, so stayed tuned! Here are some more ideas (I haven’t tried them yet) that I have tucked away for future use regarding The Nutcracker…..
-I’m thinking next year, because my daughter has some knowledge on the subject, we can get crafty!! Here is a kit that you can buy, where you can paint a nutcracker yourself which would be fun. I really like these ballerinas from goodideasforyou.com here. -There are several coloring books and stickers and such out there that may be nice to have around the house. -I do also believe that next year will include a movie of some sort. We actually had one from the library, that we never got to, but next year I will probably be checking those out as well.